The Strategic Leader: Gen. McChrystal "Stoned"
Just in case you've been under a rock (and there are a few out there...my waitress the other day asked me what my iPad was! ), the top military commander in Afghanistan, General Stanley McChrystal gave an interview to Rolling Stone magazine that has caused a bit of a stir. In it, McChrystal and his staff are critical of the Obama administration...pretty bluntly. 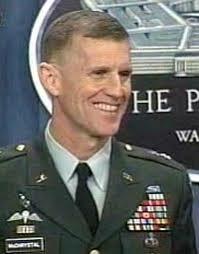 I am not so concerned about what Gen. McChrystal said and about whom he said it. That is for others to debate. What I am concerned about is the effect on the organization around and below Gen. McChrystal as they consider the behavior he modeled. Certainly, in a military organization (and others), these kinds of comments are made. But they aren't generally made for public consumption in a forum such as Rolling Stone. I am sure Jack Welch had some opinions about different people in the public eye yet I doubt I'd ever see him making those comments to a reporter. It is not out of the realm of imagination that those led by Gen. McChrystal might say, "If he says that about Obama, Biden, or Holbooke, what does he say about me?" That's probably the least of the issues. More likely, these public comments will have a negative affect on the leadership culture in the units deployed in Afghanistan. A "Runaway General" does not set the stage for great leadership of soldiers. I wonder how a "Runaway Captain" in Kanadahar province, who might disagree with the General's policies, would be looked upon by that same General? This is not just a failure of one leader. It is a failure of the leadership team that surrounded this leader. A plant manager doesn't run a plant by themself...at least not successful ones. Likewise, a successful General has a successful team around them...to have his back or to advise him of a bad decision. Make no mistake (to borrow a phrase often used by Pres. Obama), if his team was bad, it was the General who is responsible. He picked them. He cultivated the culture surrounding them. He reaps the fruits. Ultimately, this decision to do the interview falls squarely in the lap of the General. When he is fired (or as early reports are indicating--resigns), he can blame no one but himself.